Pepperstone is proud to announce their first addition of cryptocurrency to their offerings. From July 2017 Bitcoin can now be traded at Pepperstone Forex broker. 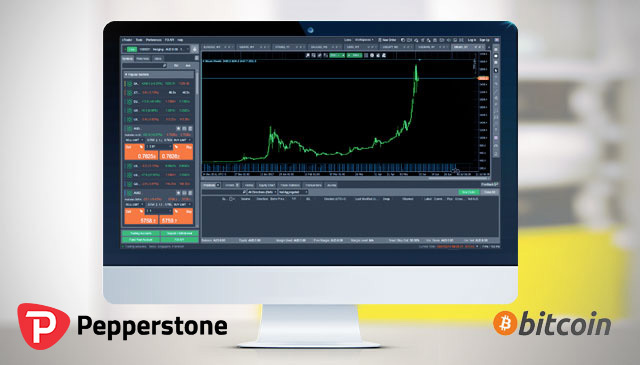 Pepperstone Bitcoin trading is offered as an instrument against the US dollar (code “BTC/USD” in Pepperstone’s trading platforms). Cryptocurrency is often referred to as the money of the future and it’s global popularity is certainly being displayed in the current BTC USD price chart, however please remember that past performance does not guarantee the future performance of any financial instrument, Bitcoin included! The decentralized control, instead of a centralised banking system, is achieved via blockchain transactional database, acting as a distributed ledger. We can delve deeper into the actual mechanics of Bitcoin in a future article, however for now we just wanted to provide a little context around the newest financial instrument being introduced by Pepperstone Forex broker. Why Trade Bitcoin with Pepperstone? Traders can hedge Bitcoin on a single Pepperstone account. See our Cryptocurrency Broker comparison for more information on the cryptocurrency CFD offered and spreads for each crypto. As with any leveraged trading, there is always risk to your capital as the the very nature of leverage means both the profits and the losses are magnified. Bitcoin is currently (2017) experiencing large volatility and movement in prices. While traders generally look for volatility to experience quicker price movement, if you are on the wrong side of the move, combined with leverage, this means not only is your capital is at risk but you can loose more than you have deposited. 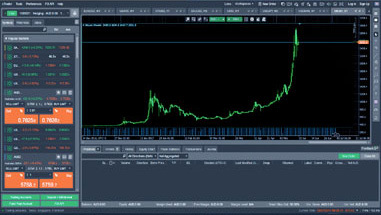 Trading Bitcoin should therefore only be considered by experienced traders, who understand the risks involved and carefully read any PDS (product disclosure statement) and/or other offer documents provided by the bitcoin trading broker, in this case by leading Australian forex broker, Pepperstone Australia.